Islam: 'Appalling and Abhorrent' in the Eyes of a Blind World? The court also ordered Ibrahim to be flogged for having sexual relations with her husband, since her marriage is not recognized by officials. Ibrahim refused a court order Sunday giving her several days to renounce her Christian faith, which resulted in the sentencing Thursday…. Ibrahim, currently jailed with her son, will be allowed to give birth and raise her second child until the age of 2 years but then faces execution. Sudanese authorities refuse to allow Ibrahim's son to reside with her husband because the husband is Christian. Tragic as this story is, it is also immensely commonplace in Islamic countries. Why? Because Islamic law does in fact punish the apostate from Islam—including with death—in accordance with the commands of the Muslim prophet Muhammad. Indeed, many Muslim clerics believe that "If the [death] penalty for apostasy was ignored, there would not be an Islam today; Islam would have ended on the death of the prophet," as top Sheikh Yusuf Qaradawi once declared on live television. Of more significance is the Amnesty International statement concerning Meriam Ibrahim's plight. While its criticism is aimed at Sudan's legal system, the statement unwittingly provides a glimpse of how the international community would view Islam if it could actually understand that these human rights abuses are not products of this or that government or regime, but of Islam itself. The fact that a woman has been sentenced to death for her religious choice, and to flogging for being married to a man of an allegedly different religion is appalling and abhorrent. Adultery and apostasy are acts which should not be considered crimes at all. It is flagrant breach of international human rights law. The right to freedom of thought, conscience and religion, which includes the freedom to hold beliefs, is far-reaching and profound; it encompasses freedom of thought on all matters, personal conviction and the commitment to religion or belief (emphasis added). If, as Amnesty International declares, flogging and executing a person, in this case a pregnant woman, because of her "religious choice" and marrying a man of a "different religion" are "appalling and abhorrent"; if they are a "flagrant breach of international human rights law"—what do we make of the fact that Muslim converts to Christianity are punished and sometimes killed all across the Islamic world? Afghanistan: A member of Afghanistan's Parliament said that all Afghans who convert to Christianity should be executed. His exact words: "Afghani citizens continue to convert to Christianity in India. Numerous Afghanis have become Christians in India. This is an offense to Islamic Laws and according to the Quran they need to be executed." As one of many live examples, Said Musa, an amputee and father of six young children, was once charged with apostasy and pressured to renounce Christianity, but he refused. So he was imprisoned, suffering "sexual abuse, beatings, mockery, and sleep deprivation because of his faith in Jesus." Algeria: The wife of Ali Touahir, a 52-year-old Muslim convert to Christianity, left him, taking their seven-year-old daughter, and is divorcing him in court. One of his wife's brothers openly threatened to kill apostate. The wife's lawyer asserted: "It is not possible that my client [the Muslim wife] still remain under the same roof with a man who has renounced his religion, as he became apostate; and we are not ignorant of the punishment that is due an apostate under sharia [death]." Cameroon: Two Muslim converts to Christianity were shot dead and two others wounded, in the Christian-majority African nation where Muslims make approximately 20 percent of the population. One of them was previously threatened by the Nigerian Islamic terrorist group Boko Haram to return to Islam or "face Allah's wrath." Egypt: A court sentenced an entire family—Nadia Mohamed Ali and her seven children—to fifteen years in prison for converting to Christianity. A born Christian, Nadia had earlier converted to Islam and married a Muslim man; reconverting back to Christianity after the death of her husband, she attempted to reflect this change formally on her identity card and her children's, which created suspicions among security, who arrested the family. Separately and days ago in Egypt, after a former Muslim woman on live television announced her apostasy and lack of faith in Muhammad as the "Messenger of Allah," she was insulted, ridiculed, and thrown off the set by the host. Iran: Imprisoned American pastor Saeed Abedini was reported as "facing physical and psychological torture at the hands of captors demanding he renounce his beliefs." The 32-year-old married father of two, who left his home in Boise, Idaho, to help start an orphanage in his former country, once detailed "horrific pressures" and "death threats" in a letter to family members: "My eyes get blurry, my body does not have the strength to walk, and my steps become very weak and shaky… They are only waiting for one thing…for me to deny Christ. But they will never get this from me." The imprisonment and torture of Muslim converts to Christianity in Iran is quite common (recall the plight of Pastor Yousef Nadarkhani). 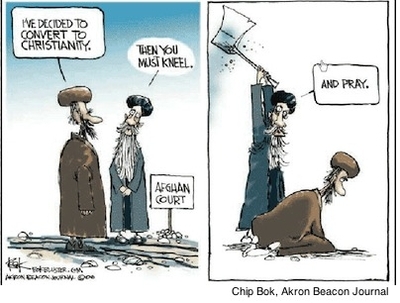 According to Adnkronos News, "renouncing the Muslim faith is punishable with the death penalty [in Iran]. Over 300 Iranian converts to Christianity have been arrested over the past two years, according to opposition websites." Kyrgyz: After a young Muslim girl converted to Christianity, her parents "wanted her to recant and renounce her faith in Christ, so they began to beat her systematically till she lost consciousness… It was winter when all of this happened, so her parents put her into a cold room and kept her there for several days. Still they were unable to break her spirit. They then started pulling her hair and put her face against the stove, burning her face. In spite of this, she remained faithful." Morocco: A fatwa, or Islamic decree, by the government's top religious authority, calls for the execution of those Muslims who leave Islam, causing many Christian converts to live in fear. Lamented one Christian: "The fatwa showed us that our country is still living in the old centuries—no freedom, no democracy. Unfortunately, we feel that we aren't protected. We can be arrested or now even killed any time and everywhere. The majority of the Christian Moroccan leaders have the same feeling. We are more followed now by the secret police than before. Only the Grace of our Lord Jesus Christ gives us courage and peace." Pakistan: A 16-year-old Muslim boy who converted to Christianity was abducted in Peshawar by Taliban-linked Islamic militants "and his fate may already be marked, as he is considered 'guilty of apostasy.'" As one Pakistani pastor explained, "If a young Muslim converts to Christianity in Pakistan, he is forced to live in hiding. Every Muslim might feel compelled to kill him. The change of religion is not punished by the civil law, it is punishable by Islamic law. For this reason cases of Muslim conversion to Christianity are very rare and some convert in secret." Muhammad Kamran, a Muslim convert to Christianity, exemplifies the pastor's words. After he told his wife of his conversion, she abused and exposed him, resulting in his being severely beaten by local Muslims. In his words: "No one was willing to let me live the life I wanted [as a Christian]—they say Islam is not a religion of compulsion, but no one has been able to tell me why Muslims who don't find satisfaction in the religion [such as myself] become liable to be killed." Saudi Arabia: After a woman was exposed as having converted to Christianity, she was sentenced to six years in prison and 300 lashes. Although she managed to flee the nation and went into hiding, the Christian Lebanese man accused of introducing her to Christianity received six years in prison and 300 lashes. Somalia: The Al-Qaeda linked Al Shabaab ("The Youth"), which has vowed to cleanse the Horn of Africa of all Christian presence, has slaughtered countless Muslim converts to Christianity—men, women, and children—in the last few years. Most recently, Al Shabaab shot to death 42-year-old Fartun Omar, a widow and mother of five, for converting to Christianity. Months earlier, they had killed her husband for the same "crime," and had been hunting for the wife. In a separate incident, Al Shabaab publicly executed a 28-year-old man after determining that he had in fact become a Christian. Al Shabaab Muslims also seized Hassan Gulled, 25, for leaving Islam and converting to Christianity, and imprisoned him, and tortured him. According to local sources, "Al Shabaab have been torturing him to see whether he would deny his Christian faith. Since last week, no information has surfaced concerning Gulled. There is a possibility that he could have been killed." Tanzania: At the time pregnant and with three children, Lukia Khalid explained how when she told her Muslim husband that she had converted to Christianity, "He threatened to kill me if I was to stay with him. I then decided to escape that night with my three children to a neighbor's house…. We left only with the clothes that we were wearing. The command was so urgent that we could not wait any longer. We had to leave immediately." Last heard, they were living in destitute conditions. One can go on and on with examples (see Crucified Again: Exposing Islam's New War on Christians, pages 96-135, for a more thorough expose, including on the doctrine and history of apostasy in Islam, and dozens of more recent examples). Are all the other anecdotes listed above not equally "appalling and abhorrent"—to use Amnesty International's words describing Meriam's specific plight? Are they not all a "flagrant breach of international human rights law"? If so, and if the international community is actually serious about putting a stop to them, should it not try to ascertain the true source behind them? After all, considering that Muslim converts to Christianity are being attacked all throughout the Islamic world—including in nations as diverse as Algeria, Iran, Pakistan, Egypt, and Kyrgyz—surely the source is not something as simple as "Sudan's legal system." The fact is, Muslim converts to Christianity are even under attack in Europe. In Norway alone, for example, two Iranian converts out for a walk were stabbed with knives by masked men shouting "infidels!" One of the men stabbed had converted in Iran, was threatened there, and immigrated to Norway, thinking he could escape Islam's apostasy penalty. Earlier, an Afghan convert to Christianity was scalded with boiling water and acid at a Norwegian refugee processing center: "If you do not return to Islam, we will kill you," his attackers told him. Of course, the true source for all these attacks on Muslim converts to Christianity—in nations that do not share race, language, culture, politics, or economics—is Islam itself. Anyone with common sense, anyone with the ability to be honest with oneself, must concede as much. There is no other reasonable way to explain such identical patterns of abuse in such a wide array of nations. But so long as the international community and human rights organizations fail to employ some common sense and honesty—fail to call a spade a spade—so will they ensure that countless more innocent humans like Meriam Ibrahim continue to suffer "appalling and abhorrent" treatment, simply for trying to exercise their "right to freedom of thought, conscience and religion" under Islam.